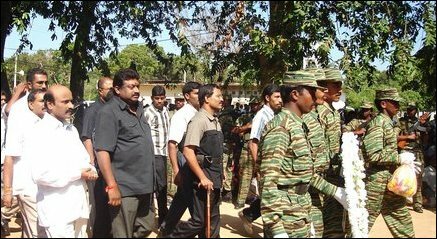 "It is the occupying Sri Lankan forces that have unleashed violence on the Tamil people. 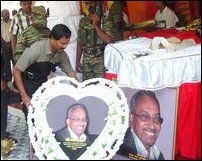 Destructive effects of such crimes will likely boomerang on the Sinhala armed forces. 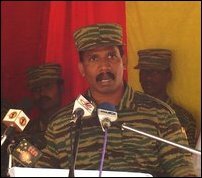 The Sri Lankan Government is solely responsible for controlling its armed forces to bring back normalcy," said the Liberation Tigers' Political Head, Mr.S. 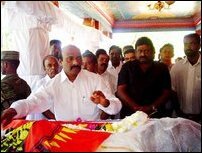 P. Thamilchelvan, addressing the mourners who gathered to pay tribute to the slain TNA MP, Mr. Joseph Pararajasingham, at the Kilinochchi Cultural Hall Wedesday morning. 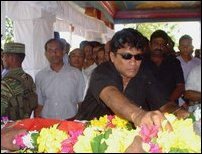 "The Sinhala nation must realize that the Tamils' thirst for freedom cannot be extinguished by killing Tamil intellectuals and honorable leaders. The representatives of the Tamil people who have gathered here today will send a clear message to Colombo," Mr Thamilchelvan added. His body dressed in white silk draped in flowers was kept for viewing during the ceremony. The event was presided over by Fr Kanagaratnam, head of the North East Secretariat on Human Rights (NESOHR). 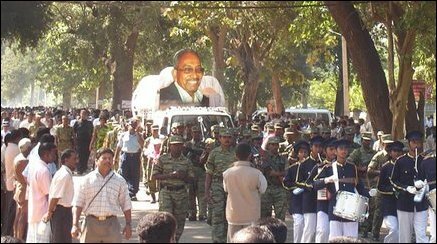 Mr Pararajasingham's body was taken to the Cultural Hall from near the Kilinochchi Central College with military parade of Liberation Tigers led by a marching band. Mr Pararajasingham's children lit the flames of sacrifice while Mr. Thamilchelvan garlanded his body.